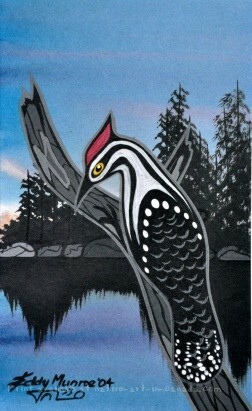 Eddie Munroe - Cree artist who paints in the woodlands style. Eddy Munroe, an Oji-Cree from Garden Hill, Manitoba was born in 1961. He started painting and carving soapstone as a young man and was mentored by Carl Ray and Eddy Cobiness. Eddy also received training from Jackson Beardy at the Jackson Beardy Art School. He exhibited in a number of cities in the United States, Europe and Japan. Eddie Munroe died on May 8th 2011 at his home in Garden Hill. His work is available at Wahsa Galleries at the Forks in Winnipeg.